Many leaders I talk with express their frustration with the lack of accountability in their organizations. Whether you’re part of a team or whether you’re a solo-prenuer, accountability is crucial to moving work forward. The number one thing we can do is keep ourselves accountable. This means keeping commitments, taking responsibility and following through with what we say we’re going to do. It means we don’t get to use the excuse that someone or something else is holding us back. If you’ve felt challenged by not moving projects forward as much as you’d like, here are 3 things you can do to improve accountability. Hold yourself accountable to hold others accountable. No one enjoys holding others accountable. When a team member or vendor doesn’t deliver a document by an agreed upon date, you might be inclined to let it slide. As obvious as it sounds, it’s a conversation that often gets swept under the carpet. And you’ll be blown away at how powerful the impact will be. Create your own “Standards of Behavior.” It’s all too easy to let our own accountability slide, especially if we’re in an environment where accountability isn’t adhered to by those around us. Or maybe we’re a sole business owner with no external pressure to stick to the plan. It’s up to you to take responsibly for your own accountability. 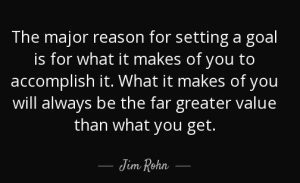 Create a list of what you will require of yourself. Post it nearby. Read it daily. This is your own personal credo. You know what inspires you. So use language that stir you deep inside. Celebrate successes. Whether it’s for yourself or for a team, celebrate moments when due dates are met and projects are completed. Positive reward is one of the best motivators to continue desired behavior. Your brain will start to connect pleasure with the empowered choices you make around accountability. Here’s an additional tool to help you stay focused on track. You’ll be able to anticipate obstacles before they come up and solve them well in advance. If you’re a regular reader of my emails or blogs, you know that I share a ton about the importance of having the right mindset. I talk a lot about overcoming limiting beliefs, crushing self-doubt and building self-confidence. Oftentimes people are looking for three quick steps to better time management or productivity. And I give you that, too. But here’s the truth: mindset is going to be the foundation for all your success. It’s like building a house, and mindset is your foundation. Strengthening skills like improving productivity is like building the upstairs rooms of your house. You absolutely need to have the upstairs rooms. But if you don’t have your foundation, the rest crumbles. I’ve built plenty of upstairs rooms, metaphorically speaking. I have studied, taught and implemented proven processes for goal-setting, project management and productivity. But when I practiced these skills without having a solid foundation, I crashed. The truth is that for years I lived with a crack in my foundation. I got kind of a hard kick at a young age when I experienced a traumatic loss in my life – the death of my mother. Mom died when I was 9 years old. It was as if my life suddenly went from living color to black and white. The blissful childhood I knew was finished. Over the next several years I slid into a tailspin of grief, loneliness and fear. Within two years, I fell into suicidal depression, substance abuse and a sense of loss that followed me well into adulthood. Why am I telling you this? Because I had a crack in my foundation that I needed to repair before I could have the life I wanted. What started as an 11-year-old cry for help, eventually developed into habitual thought patterns of how bad life was. And these habitual thought patterns evolved into deeply rooted limiting beliefs. For years I cried out, “why God, why?” And without fully realizing it, my default thinking was to blame everything around me for anything bad thing that happened. “Life’s not fair,” became my anthem. I blamed circumstances for my lack of success. I envied those around me for having it “so much easier.” If I didn’t get the promotion, or if business didn’t go the way I wanted, or I didn’t have the relationships I wanted, it was someone or something else’s fault. I saw myself as helpless. And for years, things stayed the same. Until one day I saw that my own sense of victimness was keeping me from experiencing everything I was trying to achieve. In my life’s journey, I was fortunate to have been handed a set of tools to re-build my foundation. In my painstaking search for relief from depression and alcohol abuse, I studied psychology, practiced spiritual principles and learned from all the self-help motivational gurus. Change your thoughts, and you can change your life. For me, the life-changing moment was learning that I had a choice in how I wrote the story that played out in my mind. I could create my own reality by choosing my thoughts. I could create the movie that would become my life. I was the writer, director, producer and star character in my life’s story. Learning that I could write my own story was like having a key that unlocked a hidden door into the technicolor land of Oz. When I learned the keys to a life of empowered thinking, the doors of heaven opened up for me right here on earth. I discovered a clear sense of purpose for my life, I began doing work that I feel I was born to do. Helpful “coincidences,” started showing up in business and career. New relationships with amazing people seemed to appear out of nowhere both personally and professionally. And old relationships blossomed into deep connections like I’d never experienced before. If your life, career or relationships aren’t going your way, start re-writing your life’s story. I have an awesome resource that you can use to help you change your habitual thoughts that are keeping you stuck. For many people, part of the problem is that their powerless thinking isn’t even conscious. 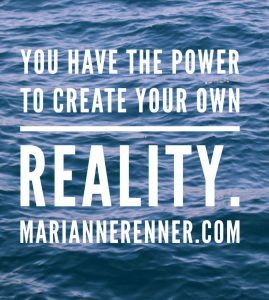 I’ve had many clients say, “wow, I didn’t realize I had a choice.” But once you have that realization, get ready for incredible breakthroughs. Here’s a worksheet that’s designed to help you increase awareness and make the shift to empowered thinking. Once you download this free worksheet and begin to use it, I’d love to hear from you. Be sure to come back and visit and leave me a comment! Last week I wrote about how to build up your confidence muscle. And if you are one of the many who feel like your self-confidence could use a boost, then it’s possible that you also struggle with decision-making. Difficulty in making decisions isn’t always linked to low self-confidence. But if you struggle with low self-confidence it’s likely your decision-making skills could use a boost. Last week I gave you my 3-step training regimen for increasing confidence. Here are 3 more tips that will help with both decisions AND confidence. Getting better at making decisions takes practice just like any skill. If you want to get better at dancing, you probably attend a regularly scheduled dance class. The same goes for building your decision-making muscle. You’re going to want to be intentional about practicing your skill. Take out your calendar. Block time each day, even if it’s only 15 minutes. During that 15 minutes, identify 2 or 3 decisions you will make that day. Give yourself a time limit and stick to your guns! People who suffer from paralysis by analysis often worry about the consequences of making the “wrong decision.” So start with small decisions that have little or no negative consequences. How long does it take you to decide what to eat at a restaurant? If ordering your dinner turns into a 60-minute, hair-pulling, nail-biting session, start here. Get out your mobile device and set your timer for 60 seconds. You’ll quickly learn that making decisions isn’t nearly as painful or consequential as you made it out to be in your mind. You’ll get more comfortable, and in time, larger decisions won’t feel so scary. 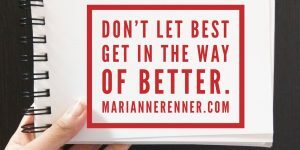 One of my favorite mantras from leading teams in process improvement is, “don’t let best get in the way of better.” In other words, you’re probably struggling between two really good options. You’re worried because you want to make the perfect choice. But this is going to keep you stuck. You worry about all the ways your decision can go bad. It’s always better to focus on the progress that will come from your decision. Remind yourself that no matter which choice you make, things will be better. Always go for progress, and let go of the idea of perfection. Good news – no one is born with confidence. It’s not something that’s rationed out in limited supply where only the first ones in line get a share. Confidence is something that’s developed. It’s gained through practice and consistency. Think of confidence as being like an extra muscle. You can make it stronger just like you can develop any other muscle on your body. In fact, let me give you my 3 basic training tips to help build and strengthen the confidence muscle. If you’ve ever been to the gym, then you know that the way to build your muscles is to apply stress or resistance to them. In a former life, I lifted a lot of heavy weights, and it was so cool to see my muscles grow over time. But just like any other muscle-building regimen, it’s best to ease into the exercise routine for your confidence muscle. Start slow and gradually build up. Otherwise, you might end up feeling a lot of pain. Exercise the confidence muscle by gaining practice in area where you feel you need to improve. The key is to start slow and gradually increase your level of difficulty. The more you practice, the better you get. And the better you get at something, the more confidence you develop. Confidence increases with your comfort level and skill level in any given area. For example, if you want more confidence in social situations or in business networking events, start building your confidence by practicing in a way task that doesn’t feel too overwhelming. Start by talking to someone you know in a social environment. Ask him or her to introduce you to someone new at the event. Then graduate to a more difficult exercise by approaching someone you don’t know on your own and start a conversation. Just like any other exercise regimen, the key is to consistently practice a skill. Gradually increase the level of difficulty. As you practice, you get better and your confidence builds. The key is practice. Practice equals skill development, and skill development builds confidence. Step 2: Muscle Rest and Recovery. Any personal trainer will tell you that resting is a critical component of any muscle-building program. In fact, it’s actually during periods of rest and recovery that your muscles grow. During the exercise phase, the tissues are actually breaking down, and the rest period is when they heal and grow. When you’re building your confidence muscles, take time to stop, rest and reflect on your skill development. After you “exercise,” or practice a new skill, take a pause. Ask yourself what worked well. What did you try that didn’t work? What can you try next to keep building those confidence muscles? If you want more confidence, you will need to be intentional. So think about the skill you’re developing, and create a plan for your growth. Step 3: Feed your Muscles. This is the best part of any muscle-building regimen! Believe me, I used to be a competitive bodybuilder, and boy did I love the reward of a big meal after a hard workout! When it comes to feeding your confidence muscles, give yourself a huge reward after every success. I tell my coaching clients to celebrate their wins. One big reason people lack confidence is because they don’t recognize their successes. One common trait among people with low self-confidence is that they discount the successes in their lives, careers and businesses. No matter how big or small, acknowledge your wins and do something to congratulate yourself. Let yourself feel really great after you attend that networking event or give that presentation in front of an audience. Continue this cycle of exercise, rest and reward, and you will be sure to see your confidence muscles expand. Go bulk up! So many people are struggling like crazy to grow their businesses, elevate their careers or earn more income. Maybe you just can’t seem to land that new customer no matter how hard you try. Perhaps you’ve been passed over for promotion more times than you can count. Or you just can’t seem to find that perfect dream job you’re searching for. The answer to finding what you’re looking for just might surprise you. When I was about 5 years old, I remember my dad teaching me how to swim. I wanted to learn to float on my back. I saw the bigger kids doing it and that looked pretty darned cool to this little kid. He put his hand on my back and told me to lie back into the water. But no matter how hard I tried, I couldn’t bring myself to let go. It just felt counterintuitive. My instinct was to keep my head up out of the water, which of course led me to sink to the bottom like an old shoe. But the very thing that I thought would drown me, was the thing I needed to do. I was trying to protect myself. I was trying to take the action that felt most natural to keep me from going under. When it comes to getting the business and career growth you’re looking for, you just may have to do the opposite of what feels natural. The key to getting what you’re looking for, is in giving it away. Think about what it is you want – a promotion, higher salary, more sales in your business, or even more love in your relationships. Instead of focusing on getting what you want, find ways in which you can give the very thing you don’t feel like you have. If you want a promotion, look for ways to give more in your job. Look for ways to give and perform as if you already had the promotion. I talk to so many professionals who prepare for an upcoming performance evaluation by planning to charge in and enlighten their bosses on every reason the company should give them more money. This may seem like the right move. But it often will backfire. Instead, what would happen if you went into the evaluation with a mindset to give more? What if you asked your boss questions about the organization’s goals for the coming year? What if you offered ways to be of greater service to the organization? The more you focus on trying to get, the more you will be chasing that which you seek. On the other hand, if your focus is on giving first, then that which you give will come back to you many times over. It’s one of life’s universal principles. As you give, you receive. When I talk with business owners, I can always tell those who are prospering. They are focused on service. When your primary focus is on service, new business will follow. If you’re trying to grow a business, think about the last networking event you attended. Did you spend your time trying to “get?” Did you move from conversation to conversation shoving business cards in people’s clasped hands? Did you spend the entire time trying to convince people why they should hire you? Or did you show up with a mindset to give? Did you spend time asking more questions about the people you meet? Were you focused on others and how you could serve them? If you’re leading a team in an organization, are you constantly driving your team to get them to produce more? Or are you focused on what you can give them to help them be their best? Only by giving first, will you begin to see new doors open. A service-mindset will be the best path to growth. This week officially marks the end of the first quarter, and hopefully you’ve made some serious traction toward achieving your goals. OK, be honest. Do you even remember setting your 2018 goals? Goal- setting at the beginning of the year really is exciting. It can be so inspiring to think about the future and all the possibilities ahead. In fact, I like to get a jump start on annual goals for my business and all other important areas of my life. I start in October, mainly because I get a lot of inspiration for new ideas by being outside in nature. And those Midwest Fall days really stir my soul. I usually set aside time on my calendar for a 1- or 2-day retreat somewhere with inspiring views where I review last year’s goals and think about my direction for the upcoming year. But come late-January, it’s easy to lose focus. Day-to-day activities kick in and take over. It’s easy to slip right into default mode, automatically going through motions and putting out fires that seem to spring up from nowhere. When I’m working with individual clients or in group settings, I recommend people put quarterly strategy sessions on the calendar. Whether you are a sole proprietor, a large employer, a team leader, or an individual working to create more harmony in your life, taking this step can be a powerful component to help you stay on track and achieve life’s most important goals. These quarterly sessions are part of what I call a sustainment strategy. Without a clear strategy to sustain and maintain momentum, goals will get lost. I suggest blocking several hours on your calendar at the end of each quarter to have a strategy session to review your goals. I often find that new opportunities have risen that I didn’t account for back in October. So I revise as needed. 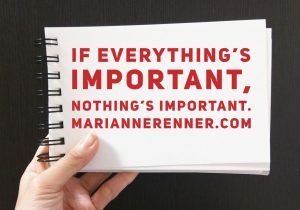 The last thing you want to do is look at your goals at the end of the year to realize that you completely lost track of what mattered most and have made no forward momentum. I would love to hear what you’re doing to stay on track toward your goals. What’s your sustainment strategy? When people are stuck in the wrong job or wrong career path, they know it. When they’re not living up to their full potential or performing at their best, they know it. The reason they know it is because it hurts. They feel burned-out, irritable, restless or worse. It just feels doggone bad. So why not do something about it? The answer usually is fear. On a typical day, I talk to at least one person about self-doubt and the fears that hold people back. One of the real biggies is the fear of rejection or criticism. Napoleon Hill in his classic book, “Think and Grow Rich,” says that fear of criticism is not only universal, but it is fatal to any personal achievement. Hill writes that this type of fear destroys initiative, decision-making abilities, and expression of individuality and opinions. Fear can be a wily adversary. We get a thought in our mind that has little or no basis for reality. It paralyzes us and robs us from living a life of passion and purpose. Will people reject you? Of course. Will they criticize you? You bet. But not as much as you think. And it won’t devastate you like your mind wants you to believe. Here’s a tip to help you take action in the face of fear. Instead of thinking about those who might reject you or say no to your request, think about those around you who will embrace your ideas and be positively impacted by your actions. If you have an idea for a new business or career change, think about those you can help and serve. Even if 90% of people think your crazy, is it worth the risk if you positively impact the remaining 10%? If you’re in a meeting where 90% of people have an opposing opinion, is worth expressing your ideas if 10% of the room is inspired? I run a leadership workshop in which I start out by asking attendees to think of one person they’ve worked with whom they consider to be an extraordinary leader. No one has a difficult time coming up with one person who has impacted their career and life. Their stories are moving, as they’ve clearly been inspired to rise higher as leaders. What if you could be that extraordinary person? You could be the one who changes the trajectory of someone’s life. What if you could be an example and a role model to just one person. Is it worth the risk? Focus on the one person you will influence, rather than the other 9 who might look at you sideways. And by the way, a 90% rejection rate is a worst-case scenario. It’s much more likely that the worse case scenario you’re thinking about is just a bad dream that exists only in your head.